In this review I'm taking a look at a very simple yet effective product. A company named Starlight Creations is marketing Latosta, which is basically an ultraportable laptop stand. 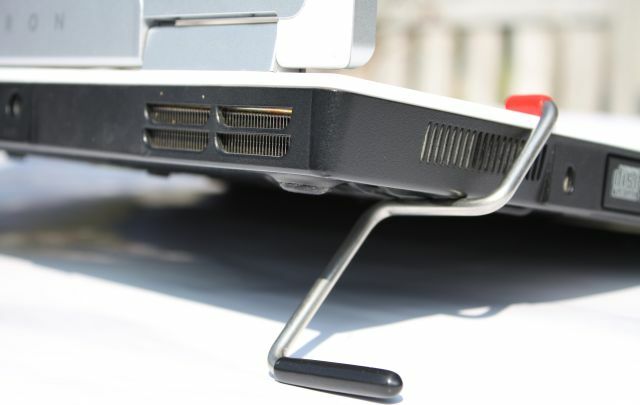 Laptop stands are handy to lift your laptop's screen to improve ergonomics and to provide some extra airflow, but the problem is that the typical laptop stand is quite bulky. You can easily walk around with a laptop in your hands and move to multiple locations, but carrying around a laptop plus a stand can be quite inconvenient as they're sometimes quite bulky and don't always fit well into laptop bags. 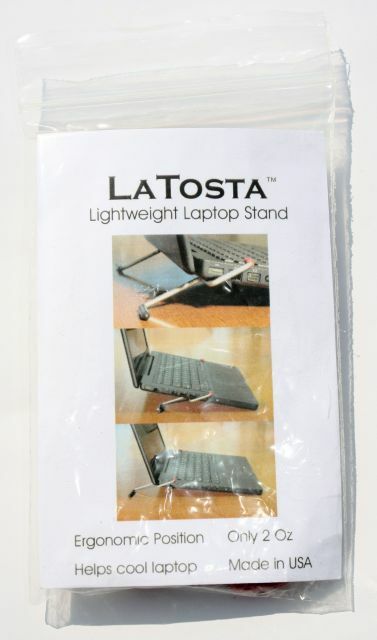 This is where Latosta comes in quite handy, this laptop stand fits in your shirt's pocket and weighs a mere 2 oz. The company ships the laptop stand in a bubble envelope. Inside you'll find a plastic ziplock bag, the minimalistic packaging features a short paper insert with some instructions on how to use it, two stainless steel stands and two black rubber tips. Just like the ziplock bag it came in, the product is quite minimalistic. 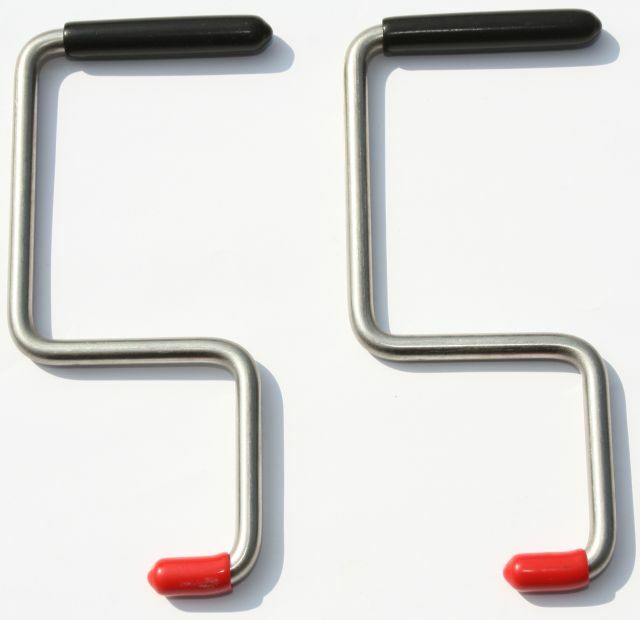 Latosta consists of two S-shaped pieces of stainless steel. The brackets easily fit into one of your pockets and they're pretty much indestructible under normal use. 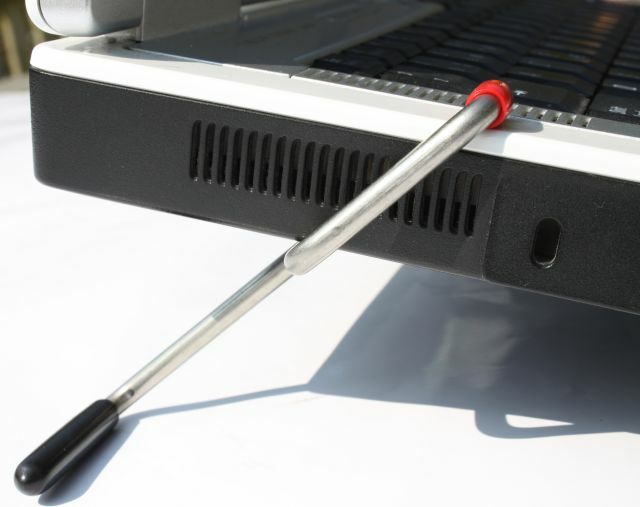 The tips of the stainless steel brackets are protected by rubber tips to prevent scratches on your table or laptop. The long black tips will rest on your table, while the short red caps rest on the edge of your laptop's keyboard. If you don't like red you can pull of the red tips and replace them with these black variants. Super lightweight at only 2 oz. 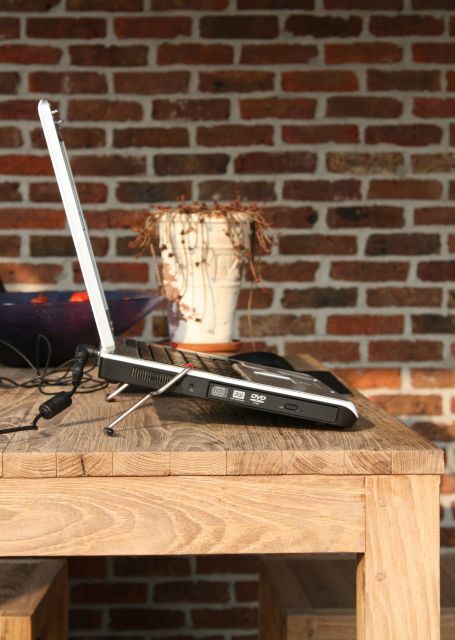 Using Latosta is quite easy, it works by creating a triangle between your table and the laptop. Your laptop's keyboard area rests on the middle part of the stand, and the upper arm of Latosta restricts the tilt of the stand. You can create a large angle by positioning the stands closer to the front, or create a lower angle by moving the stand closer to your notebook's screen. It's easier to use than I anticipated, and contrary to what I expected it doesn't wobble, it stands very firm. While Latosta is very light and very portable, there are some serious disadvantages to this design though. One of the major limitations of the product is that you need a flat surface like a table, unlike typical laptop stands this one can't be used on more irregular surfaces like your bed or couch. Due to the way Latosta is installed it may block ports or the DVD drive on some laptop models, and another limitation is that it doesn't work with all laptops, the keys should be located at least 0.5" from the edge, and the keyboard may not be thicker than 1.25". Additionally, it's also incompatible with laptops with beveled edges like the Apple Air, because these systems don't provide enough flat surface area to get a good grip. On the picture below you can see Latosta in action with a Dell Inspiron 6000. With this model it works great, no critical ports are blocked and the laptop rests very balanced on the bracket's arms, the grip is great and it doesn't wobble at all. Setting it up takes just a couple of seconds, it may be somewhat puzzling the first time you do it but afterwards it's pretty easy. One of the advantages of Latosta is that it raises the screen and tilts the keyboard to create a more ergonomic working position. As I explained earlier, the angle can be somewhat adjusted by sliding the stand closer to or further away from the laptop's screen. I didn't perform extensive tests to check the cooling potential of Latosta, but I did notice during testing that the base of the laptop got less hot and that the internal fan had to kick in less, which reduced the laptop's noise level. 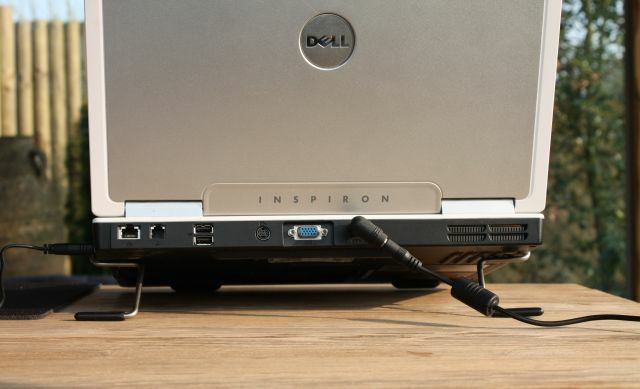 The extra airflow generated by lifting your laptop a couple of centimeters from your table will keep your hardware a bit cooler, but don't expect any miracles from it. If cooling is your main concern you'll be much better off with a laptop cooler with a big fan, but those solutions are much bulkier than Latosta and they consume electricity, which will reduce your laptop's battery life. Latosta has some important limitations but its simplicity is amazing. Granted, it doesn't look as slick as other laptop stands, but it's a very functional product that you'll love to carry around. Latosta works really well on flat surfaces and due to its small size it easily fits in any laptop bag or even in one of your pockets. Using Latosta can reduce stress on your wrists, neck and shoulders, and another benefit is that it enables your laptop to breath, which results in somewhat lower temperatures and lower noise output. Latosta is available on the company's website for $9.95 (excl. shipping). I give the Latosta a rating of 8.5/10.